Did you know that under the streets of Paris there are secret tunnels which link almost the whole city? The Paris Catacombs were created by quarrying hundreds of years ago and there are all sorts of stories about people living down there to this day. The vast majority of the city’s catacombs are off-limits to visitors however, but one small section – about 2km – is now a tourist attraction. The whole thing is a bit of a spooky experience though as the tunnels were used a cemetery for human remains for almost one hundred years. One minute you’re walking along empty carved tunnels, looking at some of the things the quarrymen built and the next you’re surrounded by endless stacks of human bones, all lined up in neat patterns. We found it both fascinating and disturbing. 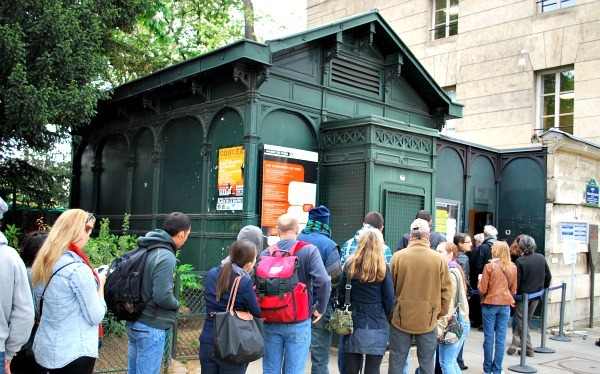 The Catacombs entrance is a green hut, opposite the entrance to Denfert-Rochereau metro station. This is an extract from our free Paris City Guide. The first thing you notice when you enter the catacombs is just how far down they are. The 130 step spiral staircase at the entrance takes you to around 20 meters under street level which is well below the sewers and metro lines. There are some information panels in English which tell you how the tunnels were formed and then your underground journey begins. At first, you walk down lots of different tunnels before arriving at a former quarry workshop area. Here, the quarrymen have used stacks of rocks to support the ceilings. Then you see some of the other features that the quarrymen created, like sculptures and a well which allowed access to the water table. After that you enter the ‘Ossuary’ which is the area which was used as a cemetery. In 1780, the largest cemetery in Paris was closed and it was subsequently decided that the human remains from all the city’s graveyards would be moved into the catacombs. The remains of six million people are stored down here and you can’t really prepare yourself for the sight of all those bones in neatly stacked lines. It’s a disturbing sight, but is somehow more so because so much time was taken to lay them in decorative patterns. It’s really surreal! Carved stone features tell you which church the bones came from. After the ossuary, there are more tunnels before the climb up a small spiral staircase (83 steps) back to street level. We’d have liked to have known more about the social side to the catacombs – have people lived in them? Is there any truth to the stories of a working movie theatre down there somewhere? On the whole though, we enjoyed the catacombs. There are a few things to think about before deciding to visit. Firstly, there is no lift, no toilets, rough ground, cramped spaces and slippery surfaces, so you need to be prepared for that. Secondly, you do need to be sure that you want to see human remains! 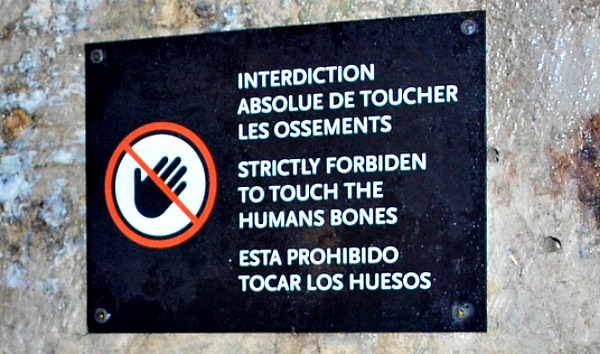 And thirdly, only 200 people are allowed in the catacombs at any one time, so sometimes the line to get in is long. We waited about an hour, but there are times when the wait is much longer. Our top tip would be to arrive about half an hour before the catacombs open at 10am and count the number of people in the line. If it’s under about 150, you should go straight in. Bear in mind that if it’s above 250 though, you won’t be going in until at least 10.45 as it takes around 45 minutes for a visit. 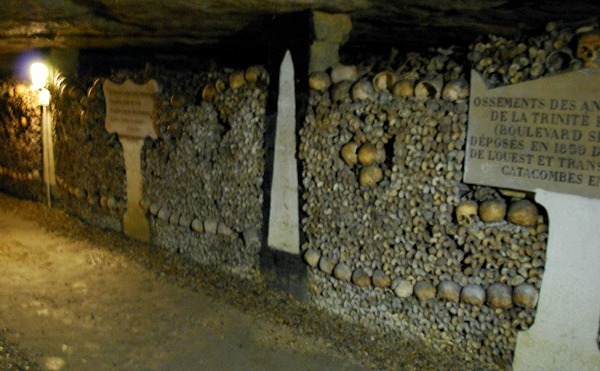 You can also skip the line by booking onto a Small Group Paris Catacombs Tour. 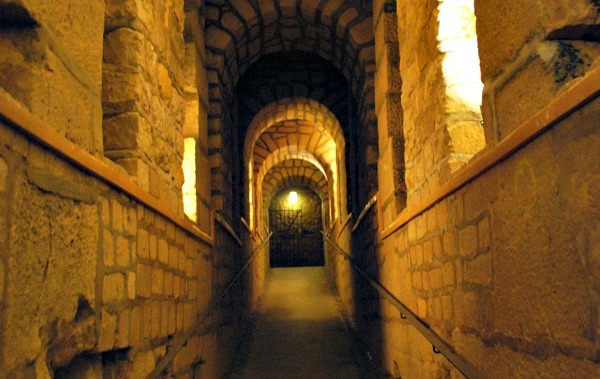 The Paris catacombs are open every day except Monday from 10am to 8pm (last admission is 7pm). Adult admission is 10 Euros (2014 prices) with discounts available for young people with ID. An audio guide is also available at an extra cost of 3 Euros, but we didn’t take it. The Catacombs entrance is right across the street from the Denfert-Rochereau metro stop.